The original Quick Spin Minifuge is available with two different rotor configurations. The strip tube model holds two 8 x 0.2 ml PCR strip tubes or 16 individual 0.2 ml tubes. The standard model accommodates 6 x 1.5/2.0 ml tubes directly and smaller tubes with adapters. Both 0.5 and 0.4 ml adapters are supplied with the standard unit. Requiring less than six inches of bench space, the economical Quick Spin Minifuges are ideal for personal use. 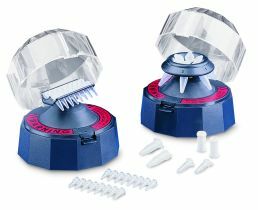 Both units can be used for applications such as microfiltration of samples and quick spin downs from the walls and caps of tubes. Operation of the centrifuge begins when the lid is closed. The rotor is quickly accelerated to 6000rpm. Upon opening the lid, the rotor comes to a stop.